Dogwoof sent over some information about their new documentary about The Maldives' problems with global warming. This time we have been sent over the UK trailer. I'm not sure how different it is to the US one that I posted earlier. 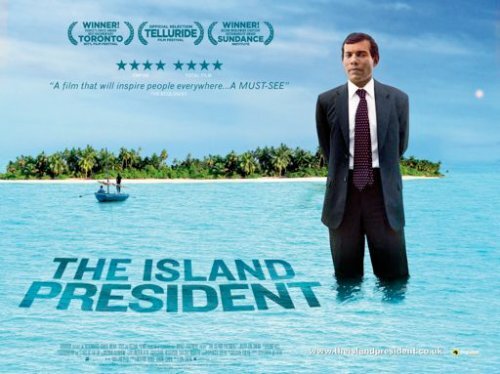 THE ISLAND PRESIDENT captures Nasheed’s first year of office, culminating in his trip to the Copenhagen Climate Summit in 2009, where the film provides a rare glimpse of the political horse-trading that goes on at such a top-level global assembly. Nasheed is unusually candid about revealing his strategies – leveraging the Maldives’ underdog position as a tiny country, harnessing the power of media, and overcoming deadlocks through an appeal to unity with other developing nations. When hope fades for a written accord to be signed, Nasheed makes a stirring speech which salvages an agreement. Despite the modest size of his country, Mohamed Nasheed has become one of the leading international voices for urgent action on climate change.